Angelman Syndrome may present with “happy puppet” symptoms ( ataxic gait and inappropriate laughter. Patient with Angelman Syndrome may also present with seizures and mental retardation. 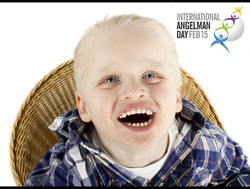 Angelman Syndrome may occur due to deletion on chromosome 15q. The deletion typically affecting the maternal part of the chromosomes. Angelman Syndrome is associated with the theory of imprinting. In this case, the same mutation of the chromosome ( deletion of chromosome 15q) may lead to different form of presentation / phenotypes. This depends on the origin of the mutated chromosome. The mutated chromosome may be paternal or maternal in origin. In Angelman syndrome the the mutation is maternal in origin.